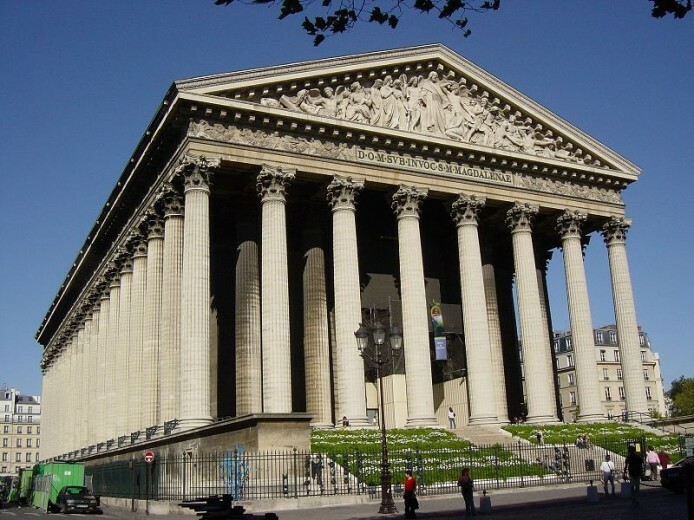 The Madeleine Church located between place de la Concorde, Vendôme square and Saint-Lazare train station, was designed for the glory of Napoleon's army. The Madeleine is built in the Neo-Classical with Its fifty-two Corinthian columns, each 20 metres high. The pediment sculpture of the Last Judgement is by Lemaire, and the church's bronze doors bear reliefs representing the Ten Commandments. The Madeleine is still a site for societies weddings and funerals, a flower market is held around the church from Tuesday to Friday. The church has a pipe organ, one of the best in Paris. Camille Saint-Saëns and Gabriel Fauré were both organists in this church, the funerals of Frédéric Chopin was held there. Numerous boutiques are around the Madeleine church, Mariage Freres (tea), Maille (mustard), Fauchon and Hediard for delicatessen. Not to be missed, La Pinacotheque, the most active private Parisian exhibition venue.